The Summer Solstice will occur this year on June 21 at 3:51 AM PDT. The Summer Solstice is always in effect until the Fall Equinox. The Summer Solstice and the Winter Solstice are always lined up with the Galactic Center which makes it a very important point in time. The planet Mercury (in retrograde) is also lined up with the Galactic Center this year. Actually I should say Mercury is in opposition to the Galactic Center which is 28 Sagittarius. Mercury will be on 28 Gemini. We feel the effects of this alignment either in conjunction or opposition. The Midwest will feel the full force of this Summer Solstice. As the Sun moved through Gemini it activated fires in various parts of the west, like Arizona and the fire in Sedona, along with the fire in Bend, Oregon. As the Sun starts its journey through the sign of Cancer on June 21 we will once again be in the water emotional energy of Cancer. I believe the energy from this Solstice will culminate on July 4th when there is again a cardinal cross in the heavens which points to Washington, D.C. There was just a major change in our government yesterday when Erik Cantor lost his election. He was number two in the Republican leadership. I believe this will have a large impact on the Republican Party. Did you hear that they are closing down HAARP? They are not only going to shut it down, they are going to dismantle it. Now if we could just get the rest of the world to shut down their High Frequency Active Auroral Research Programs we will have it made. And the Pope is firing more people who have been associated with the Vatican Bank. Changes are occurring on a large level. NASA just announced that the Sun has finished her pole shift. NASA said last fall that the Sun was in a pole shift and thought it would finish before the end of the year although they did not announce the shift was complete until June 10, 2014. The Sun will now have four poles instead of two. This information about the four poles came from a Japanese observatory. How will this new Sun affect us? Will it make any difference if it has four poles or two? I guess time will tell. The four poles on the Sun will make a cross. I find it so interesting that there was a cross on the Sun at the same time there was a planetary cross in the heavens, especially because the planets were on thirteen degrees. Thirteen is of course the number of change and transformation. I believe we are soon to finish a major transformation on Earth, and maybe also on the Sun. I know the Sun feels much hotter now than it did in the past. I now have to wear a hat in the Sun or my head starts to hurt. Maybe that is because our brains have been changing. The past couple of weeks have been very hard on the physical body for those of us who are very sensitive. I know that whenever we have a solar flare or CME my eyes become blurred. Yesterday there were two X class flares and I woke up in the morning and could not see very well so I went into http://www.spaceweather.com and saw there had been two flares plus CMEs. I feel the flares as soon as they happen. It does not matter if they are Earth directed or not. I also feel the solar wind when there is a lot of energy hitting the magnetic field of Earth. This full moon on June 12th along with the solar flares caused a lot of violence all over the world. The reason for the violence is because Mars has been in an exact square to Pluto and this causes violence. Solar flares stir up energy. We are witnessing this violence as we watch a major crisis develop in Iraq, which seemed to come out of nowhere. The strongest part of the full moon is a few days before it is full. Once it is full the energy dissipates, at least for me. Mars will start moving away from Pluto in July and then that energy will start to diminish. Then Mars and Saturn will meet in Scorpio, which will probably bring more military action to the Middle East and the Ukraine. We are also moving into fast-speed transformation. Has anyone been having a problem with their nervous system lately? I think our nervous system has been in a transformation state for a while now. I noticed it big time in the past couple of weeks. I woke up in the middle of the night about a week ago and was really cold and my body was shaking. I thought there goes my nervous system again. I think our nervous system has been activating our pineal and pituitary glands and I think we are about to move into an accelerated chakra activation including the opening of our thirteen chakras. I think it is a good idea to go barefoot on the Earth every day, if possible. This connects us to Mother Earth and I believe that is a very important thing to do. It also helps us heal, and balances our energy field. 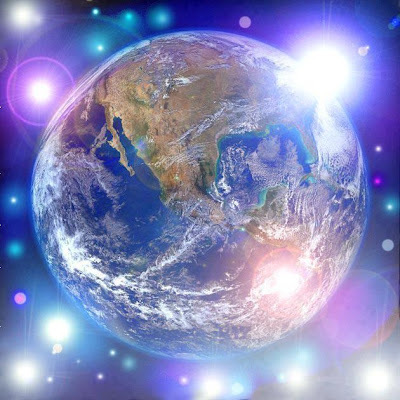 Once we make a connection to the Earth we can start activating our extended light bodies. This will include the activation of our other chakras which are connected to the Universe like our Galactic Chakra, our Universal Chakra, and our Cosmic Chakra. This is when we can start manifesting very fast. Have you noticed how fast things manifest now? It is like it is almost instant. We will also start becoming younger, healthier and full of energy. What we think is what we create so this is the time to really pay attention to your thoughts and feelings. If we put our feelings into our creations, we will then be able to start manifesting almost instantly. I am really excited about life. We are so lucky to be living through these great changes. Once we finish activating our extended light body we will have it made. Then it won’t matter what someone else does in this world because we will be living on a higher frequency world. We will then become great Beings of light and shine like the Sun in all its glory. So Be It! I send you my blessings. Donations are always greatly appreciated. I can be reached at Paypal and look for planetalert@hotmail.com or at 5028 S. 179thPl SeaTac, WA 98188 Thank you, kind and generous angels.